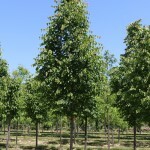 A formal, broadly pyramidal tree with dark green, shiny leaves. The fall color is yellow. It has early summer, light yellow, fragrant flowers that are attractive to bees. It is very tolerant of urban conditions. It grows best in full sun in an average, well-drained soil. 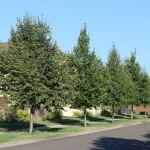 It is a very stately tree for the lawn, for shade, or as a street tree.